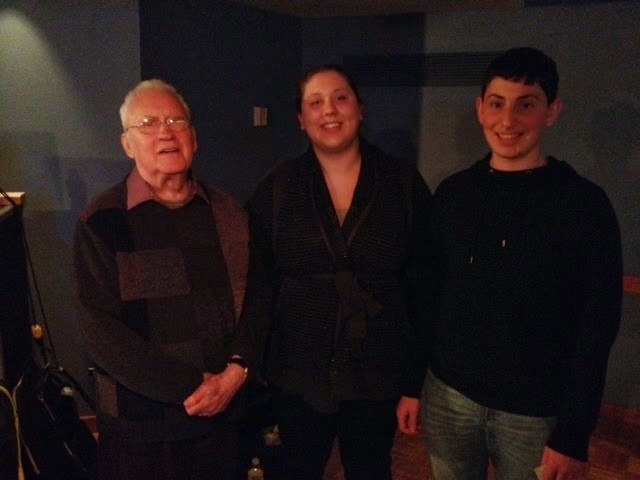 This past Saturday I went to the Regattabar to see one of my favorite jazz saxophonists play live- Lee Konitz. It was crazy to see him in person, at the age of 86! 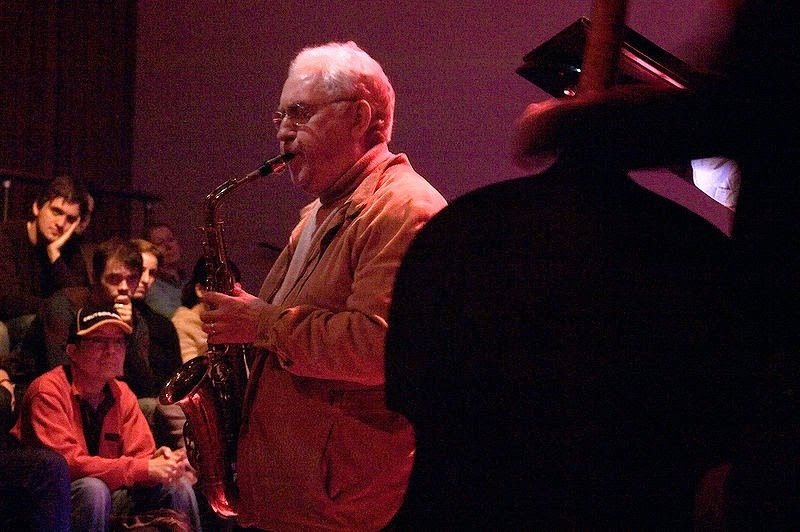 Lee Konitz is from the "cool school" of jazz and is known for his work with the pianist Lennie Tristano. He was on the Miles Davis album "Birth of the Cool" and led his own influential jazz groups. He is an NEA Jazz Master and continues to play sold out jazz concerts even in his eighties. I was really excited to see Lee Konitz play live because he is one of my favorite saxophonists. From his albums, I had come to love his full, sweet tone; fresh melodic ideas; focused rhythmic ideas; and the way that each solo sounds like a conversation. When Lee Konitz came onto the stage everyone was clapping. It was kind of tragic when Lee realized that he forgot his neck strap to hold his saxophone and actually left to go find it. Yet, the rest of his band started playing without him, and when he came back, without being told what song he was playing, he just joined in. Now, you can tell that Lee Konitz is quite old. He walks slowly, he needed to sit down a lot, he couldn't hear to his fullest, and his technical facility was not the same as from old albums that I have listened to. And that made me kind of sad. A lot of the time Lee would put down his saxophone and start singing- this was kind of strange since it was not expected. Yet, what still was in his playing at 86 year old was heart, soul, and melody. And I think that if I'm still playing at that age, I must have done something right. Lee Konitz only wanted to play standards, but each standard sounded like an open jam. He would tell his band to start a song and he would join in- always without truly being told what song he was going to play. I got to talk to the pianist after the show and he told me that Lee's philosophy is to come in as unrehearsed as possible, so it sounds fresh and spontaneous. This means that they do not even know their set list and who's going to solo when. This level of spontaneity was definitely heard. As the concert went on, Lee definitely warmed up, and started playing some old lines that I have heard. He kept his playing minimal- I think this was a combination of him being tired and him only playing what he really thinks matters. Sometimes Lee would hit something that was perfect for the moment- and I couldn't help but say "wow". I requested the band play the standard "Just Friends" because one of my favorite jazz recordings is "Just Friends" from "Lee Konitz Live at the Half Note". The band took my request and I was in jubilation. It was kind of strange when there was a break down and the band started singing, but, everything else was crazy. You could really tell that the pianist and Lee had a close relationship because most improvising stemmed from a loose sort of call and response between the two of them. Final Thoughts: The concert was not what I expected it to be, but maybe that's what made it enjoyable. I laughed and smiled a lot, and it was a really fun experience. I got to meet Lee and the rest of his band after the show, and talking with someone like Lee was out of this world. From that concert I learned that jazz is truly timeless and ageless.